Lehigh University graciously reached into their archives and provided the pamphlet of Quirk's 1973 solo show. We were able to excise several images from the brochure and they exhibit a variety of styles and subjects. Many were painted while spending time at the Ossabaw Island Foundation. Ossabaw Island is a national treasure preserved by Eleanor Torrey-West and her family for the benefit of present and future generations. 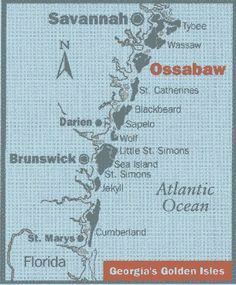 Ossabaw is a 26,000 acre undeveloped barrier island on the Atlantic Ocean owned by the State of Georgia and located in Chatham County and not too far from Savannah. The island was generously transferred to the State of Georgia on June 15,1978 and designated as Georgia’s first Heritage Preserve with the written understanding that Ossabaw would “only be used for natural, scientific and cultural study, research and education, and environmentally sound preservation, conservation and management of the Island’s ecosystem.” The acquisition was made possible by the generosity of Mrs. West and her family, a personal gift to the State of Georgia from Robert W. Woodruff, the assistance of The Nature Conservancy, and the State’s commitment to preservation of the island. The Ossabaw Island Foundation is a public non-profit 501 c3. Through a public-private partnership with the State of Georgia, inspires, promotes, and manages exceptional educational, cultural, and scientific programs that are designed to maximize the experience of Ossabaw Island, while minimizing the impact on its resources. The Foundation welcomes all creative people including writers to come and work on the island and be inspired by Ossabaw's solitude and beauty. In order to continue to balance their operating budget they are no longer able to support complimentray stays. The following is text from the pamphlet printed with the Francis Quirk; Recent Work exhibit at Lehigh Univerisity that opened on May 4, 1973. As my predecessor in the positions of educator, curator, and director of exhibitions at Lehigh University, it is appropriate that Francis J. Quirk be honored in this ultimate gallery presentation of my first year at Lehigh. It is equally fitting that this is no retrospective display of Mr. Quirk’s talent as an artist, not another “ gold watch” to be placed on his chain of achievements but rather is clear evidence of his continued vitality and contribution to Lehigh and the much larger community he has served so well and in so many ways for many years. Most of the works on display are the fruits of a grant from the Ossabaw Island Foundation and of Mr. Quirk’s efforts last fall while living on the unspoiled island off the coast of Georgia that this foundation maintains. The paintings and drawing in this exhibition clearly reveal that the artist is an Eclectic; but it is hardly a negative judgment to define his work in this way. 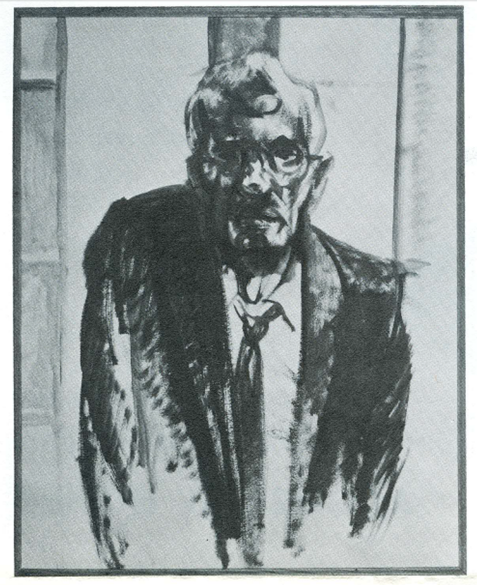 The variety of subject matter –portraits, genre scenes, nature studies, abstractions of “found objects” –and the range of techniques that Mr. Quirk has employed on his canvases to communicate his reactions to these subjects supports his own estimation of his approach to art: that the eye is a window, but that the hand, in recording what the eye sees, does so also under the controls of emotional reaction and of reason. Thus he sees an object, a sitter’s character, the essence of a landscape or genre scene not merely through lenses, but through his own feelings for these subjects and through knowledge of how such subjects have been seen by generations of artists before him. He then applies that technique or composition which best suits the qualities in the subject and his feeling for it, in order to communicate these to us, his audience. Hence his study of a constructed, found object such as “4 Step Gantry Gate” has “hand-edged,” “op” qualities as well as Picabia-like realism in a mechanically impossible construction and is executed suitably in acrylic. His “Glossy (im.) 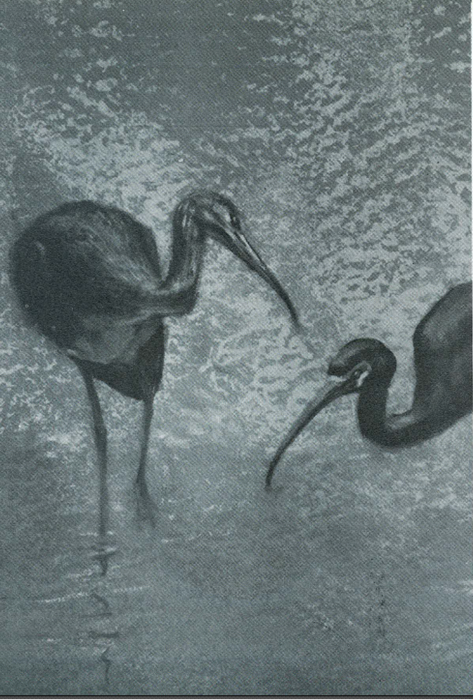 & White-faced Ibis,” employs the soft naturalism of a Degas to capture the mood of the scene at Ossabaw; while his “Portrait of the Artist #3” is done in a forceful, slashing technique, analogous to that of De Kooning, that grants us more than a mere superficial view of the artist’s facial topography. Mr. Quirk is “his own man,” a Yankee individualist, bound to no single school of painting or fashion of the moment. 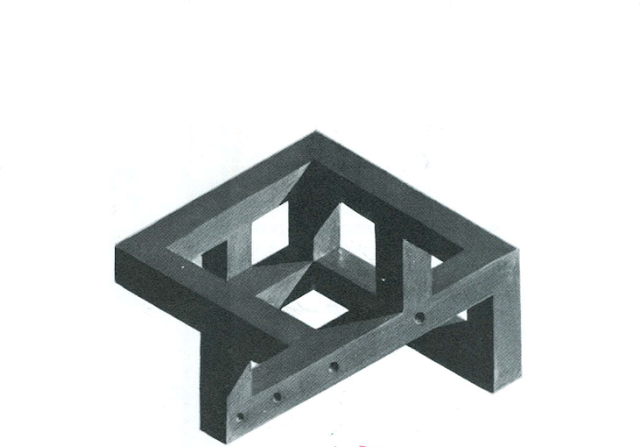 Black and White Image of Four Step Gantry by Francis J. Quirk Gate Acrylic on Canvas From Exhibition Pamphlet at Lehigh University. Black and White Image of Glossy White Faced Iris by Francis J. Quirk Gate oil on Canvas From 1973 Exhibition Pamphlet at Lehigh University. One interesting aspect of Quirk’s work is that he was so versatile; using watercolor, oil, acrylic and pastels. He also had a variety of styles; the Four Step Gantry Gate is reminiscent of Escher’s work, and Portrait of the Artist #3 evokes De Kooning. While he was awarded with the Ossabaw and Tiffany fellowships, he did not achieve widespread fame in his own lifetime. Perhaps that versatility worked against him.